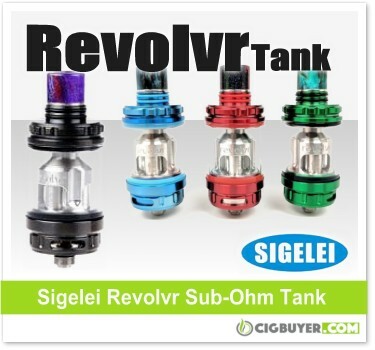 Sigelei Revolvr Sub-Ohm Tank – ONLY $9.00!!! Earlier this week Ecig-City placed a bunch of Sigelei products on clearance, including the Sigelei Revolvr Sub-Ohm Tank for only $9.00 (with coupon below). Although it’s not the newest tank on the market, the replacement coils are still widely available and the Revolvr is definitely a unique setup with plenty of cloud (and flavor) producing ability. At 24.5mm in diameter, it’s capable of holding up to 4ml of e-juice and incorporates an innovative drop-in coil system that houses three or four independent coils, allowing for unparalleled customization and performance. It features dual slotted bottom adjustable airflow and comes with both glass and resin wide bore drip tips.